TrueBlue Inc. reported revenues of $628 million in the second quarter of 2015, up 38.0% from $453 million in the second quarter of 2014. Net income totaled $17.3 million, up 7.4% from $16.1 million in the second quarter of 2014. Legacy TrueBlue revenue was $459 million in the second quarter, up 1.4% from $453 million a year ago. Seaton’s revenue was $168 million in the second quarter. Seaton was acquired effective June 30, 2014. Therefore, the comparative prior year amounts are not presented. The Conference Board Leading Economic Index for the U.S. increased 0.6% in June to 123.6, following a 0.8% increase in May. The Conference Board Coincident Economic Index for the U.S. increased 0.2% in June to 112.5, following a 0.2% increase in May. The Conference Board Lagging Economic Index for the U.S. increased 0.7% in June to 117.6, following a 0.1% increase in May. The number of people applying for unemployment benefits in the week ended July 18 fell by 26,000 to 255,000, the lowest level since November 1973, according to the U.S. Department of Labor. Economists surveyed by MarketWatch had forecast claims of 282,000. The average of new claims over the past month edged down by 4,000 to a seasonally adjusted 282,500. Make this the year you stand out professionally by earning the Certified Staffing Professional®, Technical Services CertifiedSM, or Certified Search Consultant® credential from the American Staffing Association. 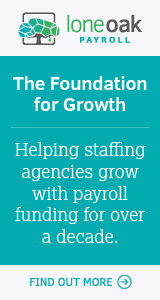 For a small initial investment in your future—and in the future success of your company—you can earn one or all designations and be recognized as a committed and knowledgeable staffing industry professional. 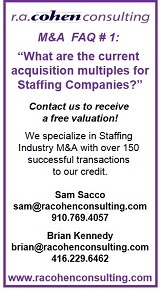 Get the details at americanstaffing.net.